Speaking during the homily at morning Mass at the Casa Santa Marta Pope Francis reflected on the love the Lord has for each of us. 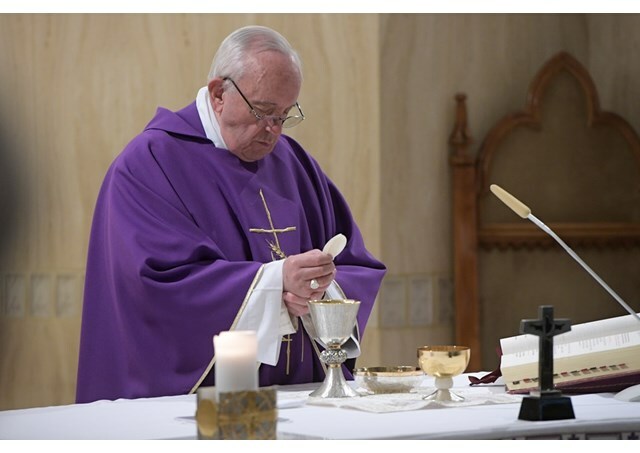 Addressing the faithful present for morning Mass on Thursday, Pope Francis said that to seek the Sacrament of Penance is not like going to the Laundromat to wash away the dirt, it is to receive God’s loving embrace. As we approach Holy Week, the Pope reiterated that the Lord is ever faithful and that he never forgets us, and this, he said, gives us reason to rejoice and to hope. Referring to the first liturgical reading of the day from the Book of Genesis, he recalled God’s promise to maintain his covenant with Abraham, a covenant, the Pope said, He will remember forever. “God’s love is like the love of a mother. He never forgets us. Never. He is faithful to his covenant. This gives us security” and even in moments of difficulty we can be sure that He has not forgotten us, he said. “God cannot disown himself, he cannot disown us, he cannot disown his love, and he cannot disown his people” the Pope said: “because He loves us and this is the faithfulness of God”. Francis then reflected on the fact that when we seek the Sacrament of Penance we must not do so as if we were going to the Laundromat to wash away the dirt: “No. We go to Confession to receive the love of this faithful God who always awaits us. Always”. Pope Francis concluded with a reference to the Gospel reading of the day in which the doctors of the Law picked up stones to throw at Jesus so as to “overshadow the truth of the Resurrection” and reminded the faithful to rejoice in hope because God will never leave them alone, he loves them like a mother or a father would.